OKRY!! Many people do call okra….okry. Regardless of what you call it, okra is a southern favorite. It’s an essential ingredient in gumbo and soups. My personal favorites are pickled okra and Fried Okra. Okra is the edible seed pod from the okra plant. 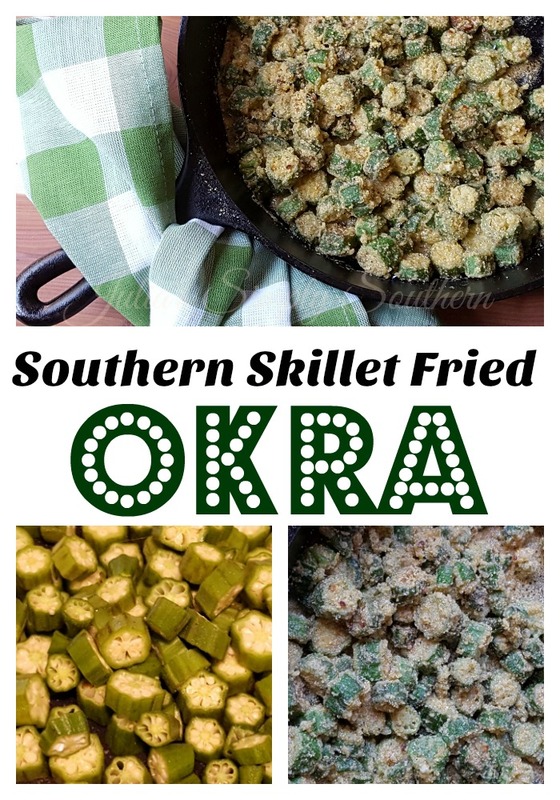 I once asked a question on the Julia’s Simply Southern Facebook Page – “What is one food you do not like?” – and was surprised that a lot of people do not like okra. It’s one of those, you either love it or hate it kind of things. So this recipe is for all the okra lovers out there!! Add vegetable oil to a cast iron skillet and heat over medium. Add okra to a colander and rinse with water. Slice okra. If you happen to come across an okra pod that the knife doesn’t want to slice easily through (you’ll know when you get one), discard that pod. It will not be worth chewing a tough piece of okra ? In a small bowl add cornmeal, flour, salt and pepper. Toss sliced okra into the cornmeal mixture and toss to coat. Add the dredged okra pieces to the skillet. Cook while turning occasionally 5-7 minutes until the coating browns. Fried Okra, a summertime favorite at the cottage! Thanks so much for sharing your post with us at Full Plate Thursday. Have a great weekend and come back to see us real soon! That's a great idea Carolyn. Just curious, how many plants do you have? These are going in my air fryer!